McCarry (The Miernik Dossier 2005, etc.) takes the story of his recurring master spy Paul Christopher back to its wildly romantic beginning. The only child of a blue-blooded American novelist and his bluer-blooded Prussian wife, handsome 16-year-old Paul is pleasantly aware that he is of interest to an equally handsome dark-haired girl of the same age, who also comes to Berlin’s Tiergarten. Not having been introduced, he has taken to calling her Rima, after the character in W.H. Hudson’s Green Mansions. Their meeting is anything but cute. In the last days before the war, young Paul stands up to a squad of Hitler Youth in the park, breaks the nose of the squad leader and is brutally beaten for his rash behavior. He is comforted by the girl, who takes him to her father, a once prominent Jewish physician now only allowed to treat other Jews. The patched-up Paul and the solicitous Rima fall headlong in love and begin an affair that is aided by the absent-mindedness of Paul’s father Hubbard and the morning absences of his mother Lori. But they have attracted the attention of Major Stutzer, a loathsome Gestapo official whose all-powerful master, Reinhard Heydrich, fancies Paul’s beautiful mother. Complicating matters, Hubbard and Lori have been using their family connections and their yacht to smuggle Jews out of the Reich, treachery of which the Gestapo is quite aware. As Stutzer’s sadistic bullying of the young couple gets rougher, the Christophers realize Paul must be ferried out of Germany while his American passport can still help him. But they have not reckoned with the sweep of young love, nor have they quite appreciated the stubbornness of their handsome young son. 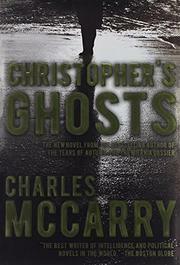 When the ill-fated affair comes to its climax, McCarry jumps to the hairiest days of the Cold War in the now-divided Berlin, where Christopher has joined the world of spies. Former spook McCarry remains at the top of his game.